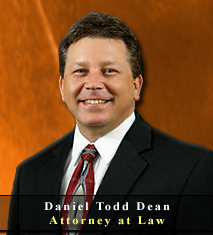 Mr. Dean was admitted to the Florida Bar and has been licensed to practice law since September 27, 2002. Mr. Dean is also admitted to practice law in the United States Federal Court, Middle District of Florida. Mr. Dean began his law career with Myron J. Mensh, P.A., prosecuting child support actions on behalf of the Department of Revenue Child Support Enforcement. When the Florida Office of the Attorney General became the Department of Revenue Child Support Enforcement’s legal counsel, Mr. Dean continued his career with the Attorney General. During his tenure as an attorney servicing the legal needs for the Department of Revenue, Mr. Dean has handled more than 1500 cases involving Paternity, Child Support Establishment and Modification, and Contempt actions. He has handled such cases in Hillsborough, Pasco, Pinellas, Manatee, DeSoto, and Sarasota counties. Since becoming an associate with the Law Offices of Jeffrey A. Herzog, P.A., in September 2007, Mr. Dean has expanded his practice to include all areas of family law, including, but not limited to, Simplified Dissolution of Marriage, Dissolution of Marriage, including children and/or property, child custody and visitation (now legally referred to as “parenting plan” and “timesharing”), adoption, civil child abuse and neglect actions (Child Dependency Actions), and civil domestic violence actions. Mr. Dean has handled such cases in Seminole, Osceola, Polk, Pinellas, Pasco, Hillsborough, and Manatee Counties. Mr. Dean has also handled cases in other areas of law, involving such actions as violations of Florida’s Unfair and Deceptive Trade Practices Act, Breach of Contract actions, Breach of Restrictive Covenants (Non-Compete Agreements in employment), Breach of Restrictive Covenants as they relate to deed restricted communities or homeowners’ associations, and Personal Bankruptcy actions.